SimpliSafe seems like a pretty simple (get it?) home security system for those of us who value our safety, but not enough to get a professional security system installed and, especially, anyone who lives in an apartment or moves around a lot. Base Station: The Base Station is the control center of the system. It wirelessly connects to the Emergency Dispatch Service to notify you and the authorities of any trouble. The Base Station also provides voice prompts during daily operation and sounds the alarm siren in the event of an intrusion. No home telephone line is required (although may use a landline as an alternate connection if you like). Keypad: The Keypad is placed by the main entrance to your home. 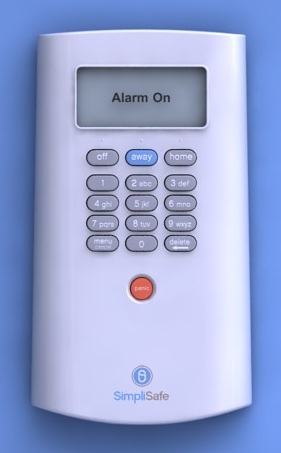 It allows you to turn your alarm on and off; tells you which mode the alarm is currently in; provides notice of any warnings, such as leaving a window open; and also has a panic button for emergencies. You can also use the Keypad Menu to adjust your system settings. Keychain Remote: The Keychain Remote can be used to turn your alarm on and off and is small enough to be carried with you as a keychain. It also has a panic button for emergencies. The SimpliSafe Easy Setup Wizard is stored on the Keychain Remote. You can order additional Keychain Remotes for roommates or family members. Motion Sensor: A Motion Sensor detects motion up to 20 feet away and 45 degrees to the left and right. It should not detect pets under 30 pounds as long as the pet can’t get within 2 feet of the sensor. By default, the Motion Sensor is only active when the system is in the Away mode and becomes active approximately 5 minutes after the alarm is turned on. Panic Button: The Panic Button triggers an alarm immediately after it is pressed. It should be placed in a location that is easy to reach in the event of an emergency, such as by your bed. To reduce the likelihood of a false alarm, the button must be held down for 1 second. The Panic Button is functional whether the alarm is off or on. There is also a panic button on the Keypad and Keychain Remote. You can install the entire package yourself and everything works using an emergency wireless band called the REFLEX network, which is used by hospitals and various other emergency services. So you don’t have to have a landline or internet connection for the system to work. Seems like a pretty good, inexpensive way to protect yourself if you live in a ground-floor apartment in a sketchy part of town. You can get a bigger system for $50 more, which covers a 2500 square-foot area, versus the 1500 square-foot area that the basic kit covers. You can also add extra sensors and whatnot to build your own package.